NRCS's natural resources conservation programs help people reduce soil erosion, enhance water supplies, improve water quality, increase wildlife habitat, and reduce damages caused by floods and other natural disasters. Public benefits include enhanced natural resources that help sustain agricultural productivity and environmental quality while supporting continued economic development, recreation, and scenic beauty. The Agricultural Act of 2014 (enacted on February 7, 2014) made several changes to the Conservation Programs reported here. The Farm and Ranch Lands Protection Program (FRPP), Grassland Reserve Program (GRP), and Wetlands Reserve Program (WRP) were merged into the new Agricultural Conservation Easement Program (ACEP). The Agricultural Water Enhancement Program (AWEP) and Chesapeake Bay Watershed Initiative (CBWI) were merged into the new Regional Conservation Partnership Program (RCPP). The Wildlife Habitat Incentive Program (WHIP) was merged into the existing Environmental Quality Incentives Program (EQIP). To learn more see NRCS Conservation Programs. The Financial Information section presents data from the USDA Office of the Chief Financial Officer's Financial Management Modernization Initiative (FMMI) system and its predecessor, the Foundation Financial Information System (FFIS). The Financial Information presented here is Total Obligations which the Government Accountability Office defines as binding agreements (orders placed, contracts awarded, services rendered, etc.) that will result in outlays, immediately or in the future. Before obligations can be incurred, budgetary resources must be made available by Congress. 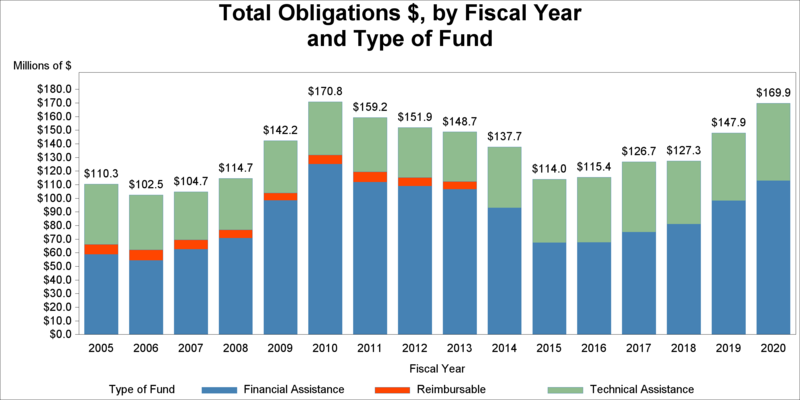 The obligations displayed for each year are the total obligations reported as of the end of each fiscal year. Subsequent adjustments after the close of the fiscal year are not included. Technical Assistance (TA) refers to the scientific expertise, natural resource data, tools, and technology that USDA personnel provide to help producers, landowners, and communities develop conservation plans and implement conservation practices to solve natural resource problems at the field, operation, or larger landscape scales. NRCS is the Federal lead for providing technical assistance for USDA and does so through various programs using NRCS staff and private Technical Service Providers (TSPs). Financial Assistance (FA) denotes payments (cost-share payments, easement payments, rental payments, etc.) that help producers and landowners pay the costs of implementing conservation measures, which can provide both on-site and off-site conservation benefits. Reimbursable funds can be for Technical or Financial Assistance but are received from sources other than appropriations. They can also be transfers from other Federal agencies. For example, the Farm Service Agency administers the Conservation Reserve Program (CRP) and reimburses NRCS for providing technical support functions. 2005-2011 data from Foundation Financial Information System (FFIS). • Totals may not exactly match sum over funds due to rounding. • Negative numbers reflect fund adjustments made throughout the year. • Other includes Biomass R&D, Colorado River Basin Salinity Control, Forestry Incentives Program, Fund for Rural America, Great Plains Conservation, Rural Abandoned Mine, SWCA, Waterbank Program, VPAP and other accounting and adjustment funds. • In 2014 CRP changed from a reimbursable to a direct program. Before FY 2014, CRP only includes reimbursable technical assistance funds used to plan and apply conservation practices. Data shown here do not include financial obligations made by the Farm Service Agency to landowners. • For GRP, except for the minor amount of due diligence funds administered by NRCS, the Farm Service Agency (FSA) administers the majority of GRP funds for both easements and rental contracts. • EWP, WRHB, and WFPO include American Recovery and Reinvestment Act funds in FY 2009 and FY 2010. • EQIP includes General, Ground and Surface Water Conservation, Klamath Basin, and 1996 Farm Bill funds. • Prior to the February 7, 2014 enactment of the Agricultural Act of 2014, AWEP and WHIP were authorized to obligate funds to new contracts. Upon enactment, the 2014 Act authorized the use of unobligated funds remaining from 2009 through 2013 to complete implementation of contracts entered into prior to the date of enactment, including the provision of technical assistance. • The Agricultural Act of 2014 (the 2014 Act) authorized the use of prior year WRP, FRPP, and GRP funds remaining from 2009 through 2013 to carry out contracts, agreements, or easements entered into prior to the date of enactment of the 2014 Act, including the provision of technical assistance, provided that no such contract, agreement, or easement is modified so as to increase the amount of payment received. Pursuant to this authority, the funds obligated in FY 2014 were used to carry out acquisition and restoration activities on those prior contracts, agreements, or easements. • CTA, PMC, SNOW, and SOIL also include multi-year funds. • CRP, CTA, PMC, RCD, SNOW, SOIL, and WSP do not provide financial assistance. • The Agricultural Act of 2014 (the 2014 Act) authorized the use of prior year WRP funds remaining from 2009 through 2013 to carry out contracts, agreements, or easements entered into prior to the date of enactment of the 2014 Act, including the provision of technical assistance, provided that no such contract, agreement, or easement is modified so as to increase the amount of payment received. Pursuant to this authority, the funds obligated in FY 2014 were used to carry out acquisition and restoration activities on those prior contracts, agreements, or easements. Conservation practices are planned and applied at the land unit level. The land unit is the smallest unit of land that has a permanent or contiguous boundary, a common land cover and land management, and a common owner or a common producer. The following chart/table combinations include data for the time period from fiscal year 2005 through fiscal year 2018. Data entry processes differed prior to 2005 and do not provide comparable data. As conservation practices are measured in different units (acres, feet, square feet, etc. ), the challenge for reporting performance at various levels is how to aggregate across practices. Although practices may affect resources beyond the land unit boundary, or be applied only on part of the land unit, the land unit does provide a common metric to aggregate over practices since each applied practice is associated with a specific land unit. Analysis of the NCP data reveals that most practices are measured in acres and most of the practice applied amounts match the land unit acres of the field on which the practice was applied. Therefore, land unit acreage is the metric on which the acres of land receiving conservation treatment are calculated. Totals presented here are not comparable to program enrollment acres or contract acres. The following chart/table combination summarizes acres receiving conservation by program and fiscal year. For the Conservation Stewardship Program, acres represent contract acres and count represents contracts in the fiscal year. For all other programs, acres represent land unit acres and count represents practice counts. 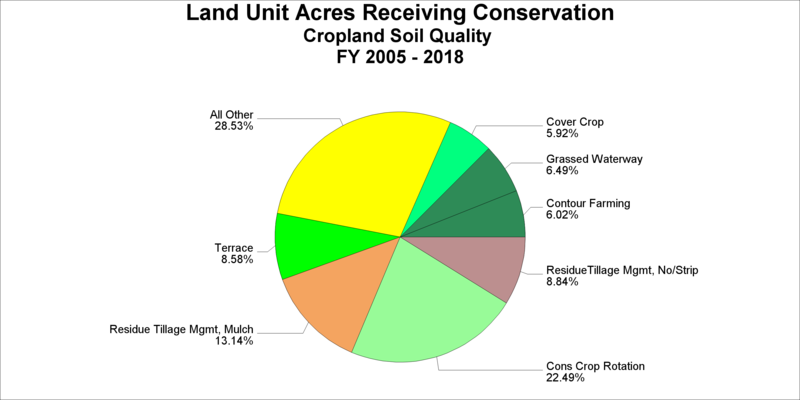 Here, land unit acres are counted once for each conservation program that has been used to apply one or more practices on that land unit in a given fiscal year. Therefore, land unit acres may be counted multiple times within each fiscal year - once for each program that has been used to apply at least one practice. Land unit acres may also be counted multiple times across fiscal years. Only programs representing a significant portion of the total for the period are included in the above chart. Programs not included are summed into the All Other category. • Data Sources: CSP Program - USDA-NRCS, ProTracts Program Contracts System, October 2018; all other programs - USDA-NRCS, National Planning and Agreements Database, October 2018. 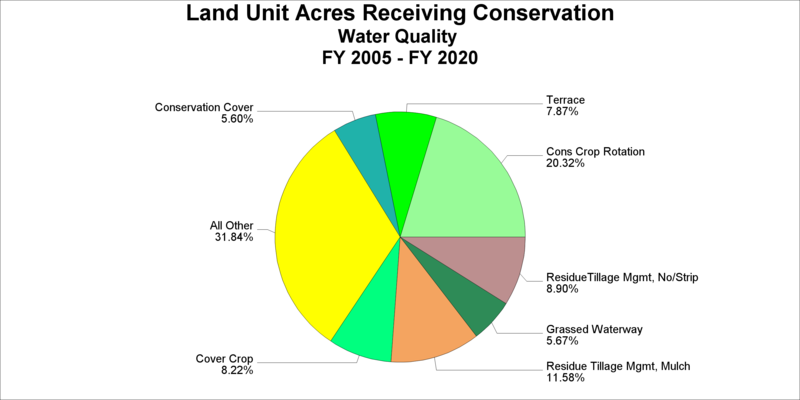 • Land unit acres may be counted multiple times across programs within each fiscal year and across fiscal years, but are only counted once per program per fiscal year. • EWP, WRHB, and WFPO include conservation practices funded by the American Recovery and Reinvestment Act in FY 2009 and FY 2010. • EQIP includes General, Ground and Surface Water Conservation, and Klamath Basin. The following table summarizes the land units treated in a fiscal year. Here, a land unit is counted only once in a fiscal year, regardless of how many practices were applied on it, or how many conservation programs were used to apply practices. These data therefore reflect the geographic extent of the land treated with conservation practices during a fiscal year. 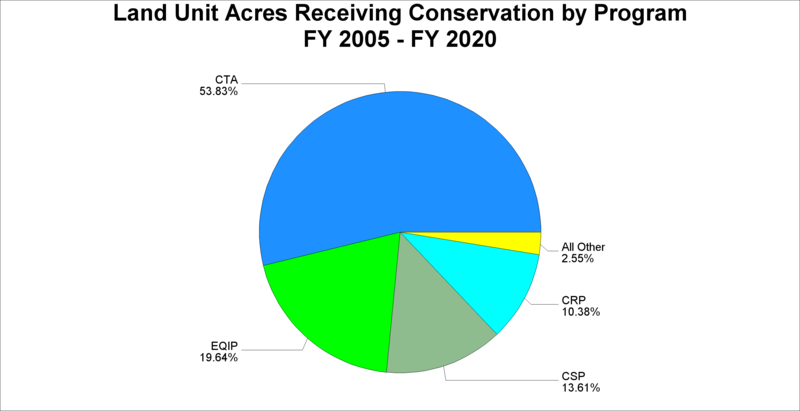 Given that multiple conservation programs can be used to treat the resource concerns associated with a specific land unit, the percentage of land units (acres and number) that are treated by more than one conservation program within a fiscal year is also shown. • Data Source: USDA-NRCS, National Planning and Agreements Database, October 2018. • Land unit acres may be counted multiple times across fiscal years. The following set of chart/table combinations present the conservation practice data grouped by purpose: Cropland Soil Quality, Fish & Wildlife Habitat, Forest Land Conservation, Grazing Land Conservation, Irrigation Efficiency, Water Quality, and Wetlands. Any practices not included in one of these groups are included in an All Other category. Data for practices in the All Other category can be downloaded in the Conservation Programs Profile csv file. Note that there is some overlap between these groupings, since some practices address multiple resource concerns. Here land unit acres are counted each time a practice is applied on that land unit in the fiscal year. Therefore land unit acres may be counted multiple times across practices, practice groupings, and fiscal years. To learn more about specific conservation practices, see the National Handbook of Conservation Practices. The following chart and table includes practices that are related to Cropland Soil Quality Management. The six components of soil quality management are: enhancing organic matter, avoiding excessive tillage, managing pests and nutrients efficiently, preventing soil compaction, keeping the ground covered, and diversifying cropping systems. Choosing specific practices within each component depends on the situation since different types of soil respond differently to the same practice. Each combination of soil type and land use calls for a different set of practices to enhance soil quality. Note that only practices applied on cropland or hay land are included. Only practices representing a significant portion of the total for the period are included in the above chart. Practices not included are summed into the All Other category. • Land unit acres may be counted multiple times across practices and fiscal years. The following table includes program information under which the above practices related to Cropland Soil Quality Management were applied. These data reflect the geographic extent of cropland treated with soil quality practices by each conservation program during a fiscal year. Land unit acres may be counted multiple times across programs and fiscal years, but are only counted once per program per fiscal year. • Land unit acres may be counted multiple times across programs and fiscal years, but are only counted once per program per fiscal year. The following table includes unique land unit acres for practices related to Cropland Soil Quality Management. Land unit acres may be counted multiple times across fiscal years, but are only counted once per fiscal year. The following chart and table includes practices that are related to Fish and Wildlife Habitat Management. The environment that NRCS helps its clients conserve, maintain, and improve is also habitat for fish and wildlife and other biological resources. While every practice and management action taken on the land has some effect on biological resources, the following practices are specifically related to fish and wildlife habitat. • Watering Facility (614) is not included in the above table. It is included for the purposes of this report in the All Other Practices category. The following table includes program information under which the above practices related to Fish and Wildlife Management were applied. 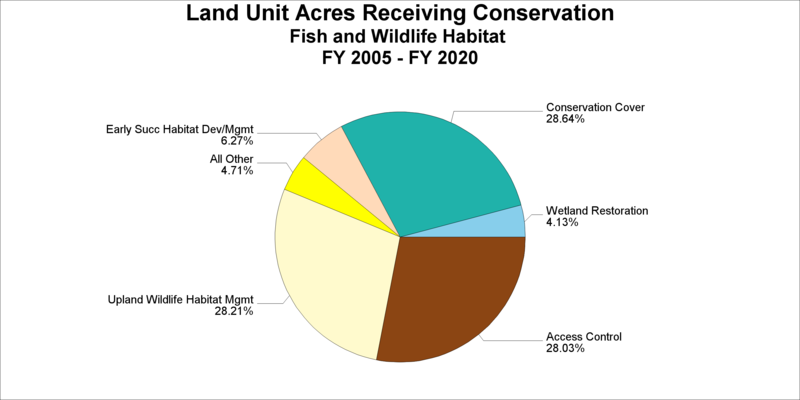 These data reflect the geographic extent of the land treated with fish and wildlife habitat practices by each conservation program during a fiscal year. Land unit acres may be counted multiple times across programs and fiscal years, but are only counted once per program per fiscal year. The following table includes unique land unit acres for practices related to Fish and Wildlife Management. Land unit acres may be counted multiple times across fiscal years, but are only counted once per fiscal year. 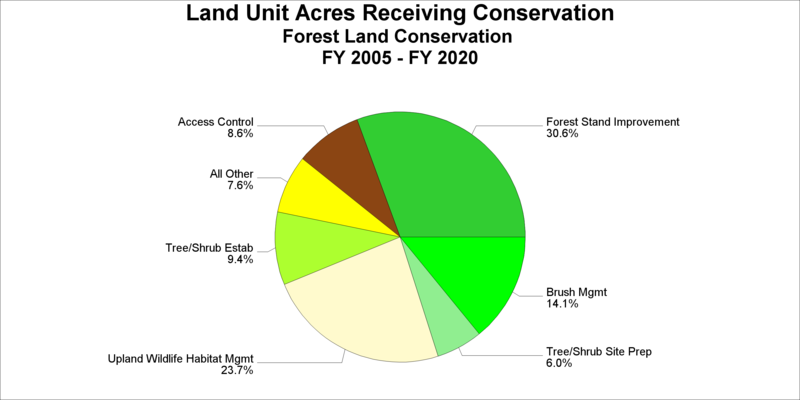 The following chart and table includes practices that are related to Forest Land Conservation. The goals of these practices are to restore and protect forest resources and improve fish and wildlife habitat and are related to: tree planting; forest stand improvement, thinning; prescribed burning; and controlling invasive plants. Note that only practices applied on grazed forest or forest land are included. The following table includes program information under which the above practices related to Forest Land Conservation were applied. These data reflect the geographic extent of forest and grazed forest land treated with conservation practices by each conservation program during a fiscal year. Land unit acres may be counted multiple times across programs and fiscal years, but are only counted once per program per fiscal year. The following table includes unique land unit acres for practices related to Forest Land Conservation. Land unit acres may be counted multiple times across fiscal years, but are only counted once per fiscal year. The following chart and table includes practices that are related to Grazing Land Conservation. 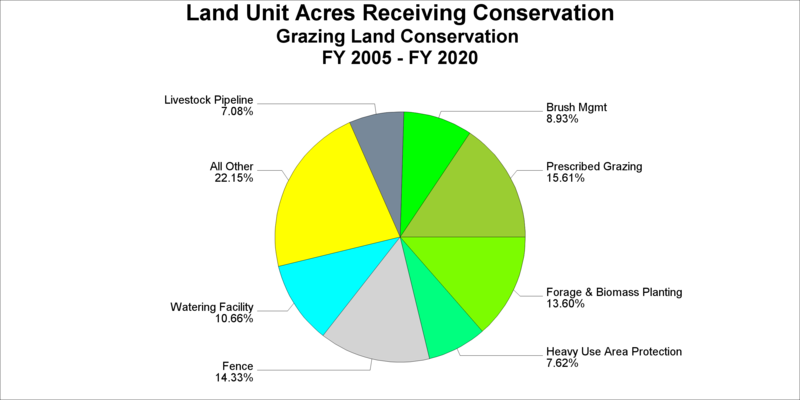 NRCS is committed to conserving and enhancing private grazing land resources. This includes conservation practices which: conserve and improve wildlife habitat on private grazing land; conserve and improve fish habitat and aquatic systems through grazing land conservation treatment; protect and improve water quality; improve the dependability and consistency of water supplies; and identify and manage weed, noxious weed, and brush encroachment problems. Note that only practices applied on grazed range, grazed forest, native and naturalized pasture, or pasture land are included. The following table includes program information under which the above practices related to Grazing Land Conservation were applied. These data reflect the geographic extent of grazing land treated with conservation practices by each conservation program during a fiscal year. Land unit acres may be counted multiple times across programs and fiscal years, but are only counted once per program per fiscal year. The following table includes unique land unit acres for practices related to Grazing Land Conservation. Land unit acres may be counted multiple times across fiscal years, but are only counted once per fiscal year. The following chart and table includes practices that are related to Irrigation Efficiency. The goal of these practices is to assist in properly designing, installing and maintaining irrigation systems to ensure uniform and efficient distribution of water, thereby conserving water and protecting water resources. Note that pumping plant (533) installation is only counted when applied on cropland or hay land. The following table includes program information under which the above practices related to Irrigation Efficiency were applied. 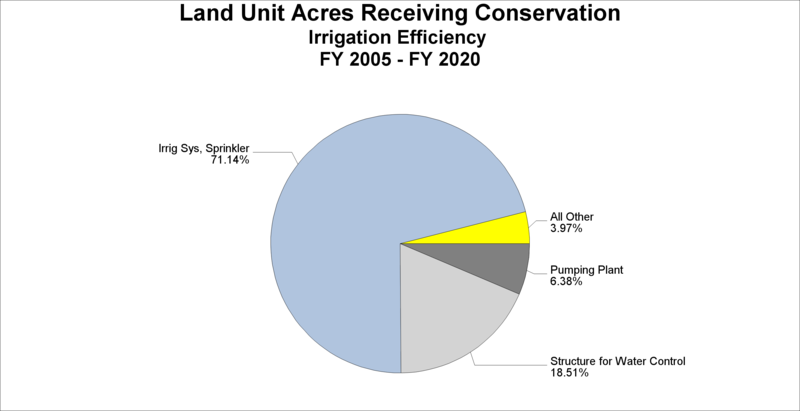 These data reflect the geographic extent of land treated to improve irrigation efficiency by each conservation program during a fiscal year. Land unit acres may be counted multiple times across programs and fiscal years, but are only counted once per program per fiscal year. The following table includes unique land unit acres for practices related to Irrigation Efficiency. Land unit acres may be counted multiple times across fiscal years, but are only counted once per fiscal year. The following chart and table includes practices that are related to Water Quality. Water quality is an indicator of the health of our environment and reflects what occurs on the land. The primary water quality issues from agriculture are sediment, nutrients, pesticides, pathogens, and in some parts of the country, salinity. Using conservation practices to improve land in an environmentally sound manner will result in better water quality for drinking, recreation, wildlife, fisheries and industry. The following table includes program information under which the above practices related to Water Quality were applied. These data reflect the geographic extent of land treated with water quality practices by each conservation program during a fiscal year. Land unit acres may be counted multiple times across programs and fiscal years, but are only counted once per program per fiscal year. The following table includes unique land unit acres for practices related to Water Quality. Land unit acres may be counted multiple times across fiscal years, but are only counted once per fiscal year. 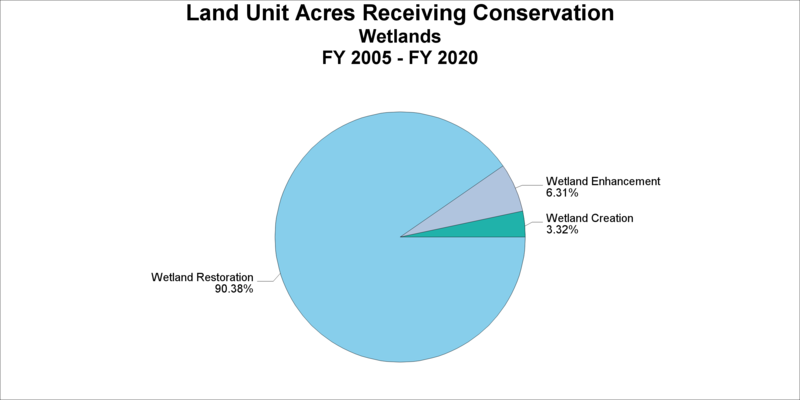 The following chart and table includes practices that are related to Wetlands. Healthy wetland ecosystems function to modulate drought and floods, provide wildlife habitat, filter pollutants, retain sediment, store carbon, and cycle nutrients. The goal of the wetland conservation practices is to restore, enhance and protect the quality and quantity of wetlands. The following table includes program information under which the above practices related to Wetlands were applied. These data reflect the geographic extent of land treated with wetland conservation practices by each conservation program during a fiscal year. Land unit acres may be counted multiple times across programs and fiscal years, but are only counted once per program per fiscal year. The following table includes unique land unit acres for practices related to Wetlands. Land unit acres may be counted multiple times across fiscal years, but are only counted once per fiscal year. The data in this report can be downloaded here.